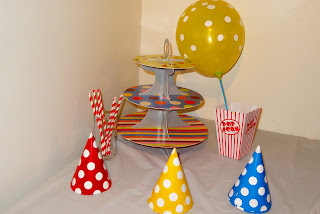 When I first thought of a circus party theme for Seb's first birthday my mind was going all out thinking THEME. I was thinking along the lines of buying the Ikea circus top, and possibly renting some signposts and props. 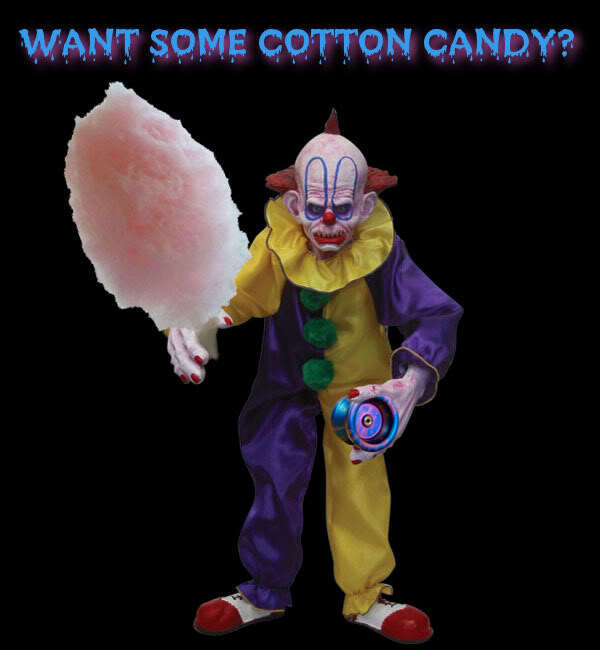 Maybe hiring a clown for the day, and hey, what about a fairy floss machine while I'm at it? Eventually though, I realised that kind of expense really wasn't necessary and I could create plenty of nice atmosphere myself. At a fraction of the cost of renting just one prop. At the end of the day, some bright colours, yummy food, and a little fun is all that is needed to make the party great, and spending hundreds of dollars on atmosphere is not going to change the outcome. 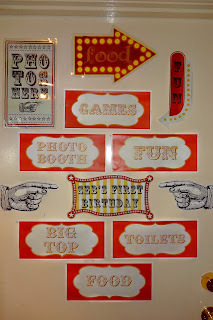 I started by purchasing the Vintage Carnival word art and element digiscrapping bundle over at The Lilypad. I like to digiscrap all my photo's, and although I don't often purchase supplies (there is so much free stuff out there) I knew I would use this bundle a fair bit and could flog it for decorations sake too! 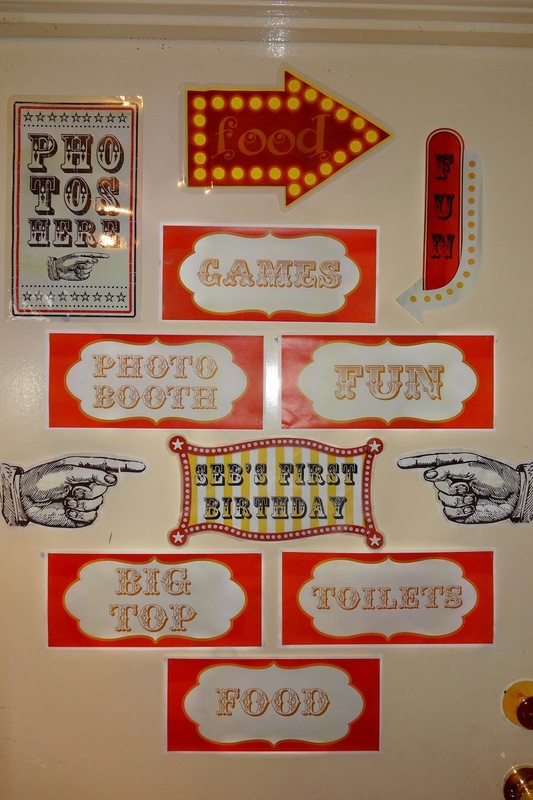 A little photoshop magic, and the Summer Fair and Circus fonts, and I had a series of fun signs that set the tone, that cost me only a few dollars in ink and paper to print out at home. Instead of splurging on the circus themed plates, cups, napkins, balloons, party hats etc, I stuck to simple plain colours that locked in the theme. Red, blue and yellow were my main colours, and whenever possible I purchased ones with dots on them. The plain colours were alot cheaper than the themed stuff, and I actually thought it all looked nicer, less tacky. 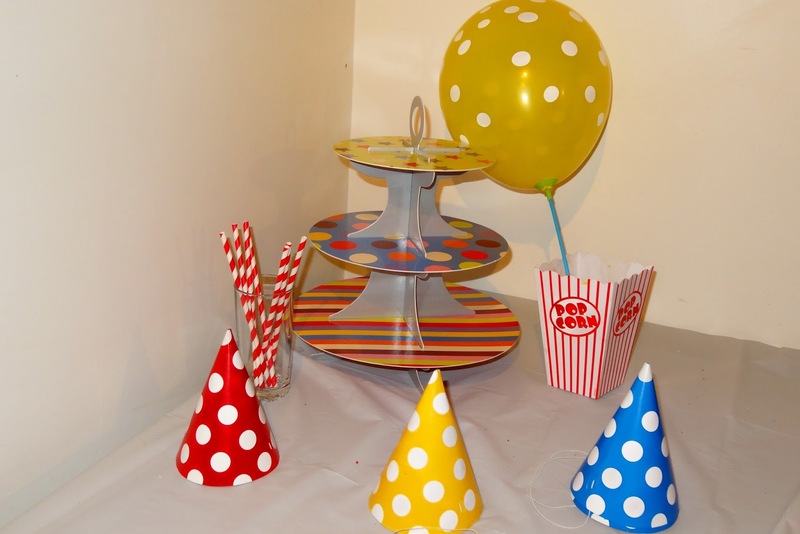 The colourful cupcake stand was on the Woolworths clearance rack for $1, and the straws and popcorn containers were my key splurge items at $2 a packet. Unnecessary I guess, but such a cute touch! 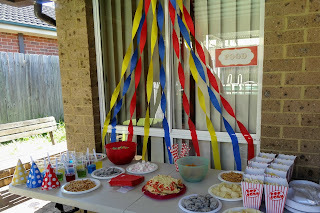 And instead of the big top canopy I wanted to purchase/rent, (for $60), I shimmied up some streamers over the food. Do you know what? People had a great time. It's not necessary to spend a fortune prettying everything up. The party looked good, my 1 year old will never remember, but we have some good photo's. And this result cost about $300 less than my original thoughts. For more circus party posts see here and here.